Sustran-discuss alerted me to a new paper, ‘Public Transport Reforms in Seoul: Innovations Motivated by Funding Crisis’ by John Pucher, Hyungyong Park, Mook Han Kim and Jumin Song, in the Journal of Public Transportation, Vol. 8, No. 5, 2005. Necessity seems to have been the mother of invention. Dramatic regulatory reforms behind improved integration! High-profile physical changes, like the median busways and ticketing changes, are just part of the story. Please don’t ignore the important but unglamorous regulatory reforms that are crucial to achieving a more integrated public transport system. The initial public response was actually disastrous, with a period of confusion and frustration! But after a month or so the confusion eased and teething problems with the ticketing system were ironed out. Public reactions then turned very positive. Benefits claimed so far include impressive increases in bus speeds (especially on the BRT corridors), reductions in bus-related accidents, and an upward trend in bus passenger numbers (about 700,000 extra per day without a drop in subway use). Operating subsidies for the bus system have risen however. But the authors argue that this should be set against reduced expenditure on metro/subway extensions with their associated debt servicing and operating deficits. Seoul's future public transport expansion plans (to complement the existing enormous subway and suburban rail systems) are now mostly focused on Bus Rapid Transit (BRT) with some LRT. By the way, the publictransit.us blog has a nice list of links to Korean mass transit sites. I suspect that some credit should also go to the long-term efforts of the green transport movement in Korea, led by the non-profit NGO, ‘Network for Green Transport’ (site in Korean only). Over more than a decade they have helped prepare the ground of public and expert opinion for reforms like these. 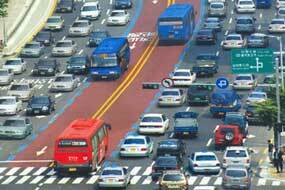 ITDP has a .wmv video on Seoul's recent sustainable transport achievements. I wonder if the bus reforms have had any effect beyond the boundaries of the City of Seoul? After all, the Seoul Metropolitan Government’s area accounts for only about half of the 22 million people or so in the wider metropolitan area, which includes Inchon and much of the province of Kyonggi-do. Excellent Paul. Might I recopy to the New Mobility Blog? In a belated answer to your final question, I would reply that yes the reform has affected suburban bus transit as well. Bus colour coding (green neighborhood buses, blue inner city long distance buses, red suburban buses) applies to buses linking Seoul to Gyeonggi-do cities (red). Lanes are reserved for vehicles carrying more than 8 passengers on certain motorways leaving Seoul, including importantly the southbound one which services major population centers in Gyeonggi-do). And Seoul's fare system (and consequently bus governance system probably) also applies, so you can travel to the suburbs with the same card used in Seoul. This requires cooperation between Gyeonngi-do city governments, under the leadership of Seoul Metropolitan Government.